Billy Dee Williams is back! A young Lando Calrissian snares the Ghost crew in his latest scheme. Yes, long before The Empire Strikes Back, Lando was a smooth-talking rogue — and you couldn't trust him as far as you could throw him. It's a pity no one tries to throw him, actually. Zeb, let's talk. If you're going to play cards as a means of buying food and fuel for your shipmates, cheat. I realize that you're not actually Jayne Cobb, and cheating is probably a crummy lesson to teach the children who are Star Wars Rebels demographic. But you know what's a worse lesson? Betting your sentient crewmates. We call that slavery. Lando probably does cheat at cards, because Lando always seems to be thinking three steps ahead and he needs a crew as resourceful and as accustomed to evading the Empire as our Rebels. He also quickly goes to work trying to charm the female members of the crew. (He's already alienated Zeb and Kanan with his superior card hand.) Hera has his number from the moment she walks on board, but she's willing to ride out Lando's weird and dangerous plans if there's a payday at the end. Sabine, it turns out, really digs guys who are into art (especially her art). Lando needs the Ghost to transport some cargo, but first he has to get that cargo from Azmorigan, a sort of poor man's Jabba the Hutt. Like Jabba, Azmorigan has a fondness for Twi'lek slaves, so Lando "trades" Hera to Azmorigan for a puffer pig — a truffle hunter crossed with a blowfish. Hera goes along with it, but she quite rightly gives Lando a knee to the groin after she escapes Azmorigan's ship and makes it back to the Ghost. A lot of this episode is devoted to slapstick, with everyone trying to work their way around the puffer pig, who gets all balloon-like when she's scared. But the point seems to be to introduce us to Lando — and people like him. Lando isn't a rebel. He's an entrepreneur — that's French for "opportunist." 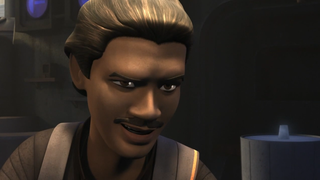 But he's smart and an alliance with him may prove useful for the Rebels down the line. Hera recognizes that, even if she doesn't get paid this time around. Too bad for our Rebels that even when they think they've pulled one over on Lando, they haven't quite. He watched Chopper run off with his fuel tank. It's one of the reasons he wasn't in a terrible hurry to pay them. He could be useful, but he's also a user. I mean, look at what happened to Han and Chewy. Oh, and Ezra reveals this week that his lightsaber doubles as a blaster. (We knew that, but now we get to see it in action.) You know, there's been a lot of griping over weird lightsabers lately, but this is a huge improvement over Ezra's old weapon.